Modern and emerging software systems, such as industrial Internet of Things, Cyber-Physical Systems, cloud and mobile computing, have to operate without interruption. Self-adaptation and self-management enable these systems to adapt themselves at runtime to preserve and optimize their operation in the presence of uncertain changes in their operating environment, resource variability, new user needs, attacks, intrusions, and faults. Approaches to complement software-based systems with self-managing and self-adaptive capabilities are an important area of research and development, offering solutions that leverage advances in fields such as software architecture, fault-tolerant computing, programming languages, robotics, run-time program analysis and verification, among others. Additionally, research in this field is informed by related areas such as control systems, machine learning, artificial intelligence, agent-based systems, and biologically inspired computing. The SEAMS symposium focuses on applying software engineering to these approaches, including methods, techniques, processes and tools that can be used to support self-* properties like self-protection, self-healing, self-optimization, and self-configuration. The SEAMS 2018 proceedings are available online at the ACM Digital Library. Pictures of SEAMS 2018 can be found at our Facebook page, particularly, here and here. 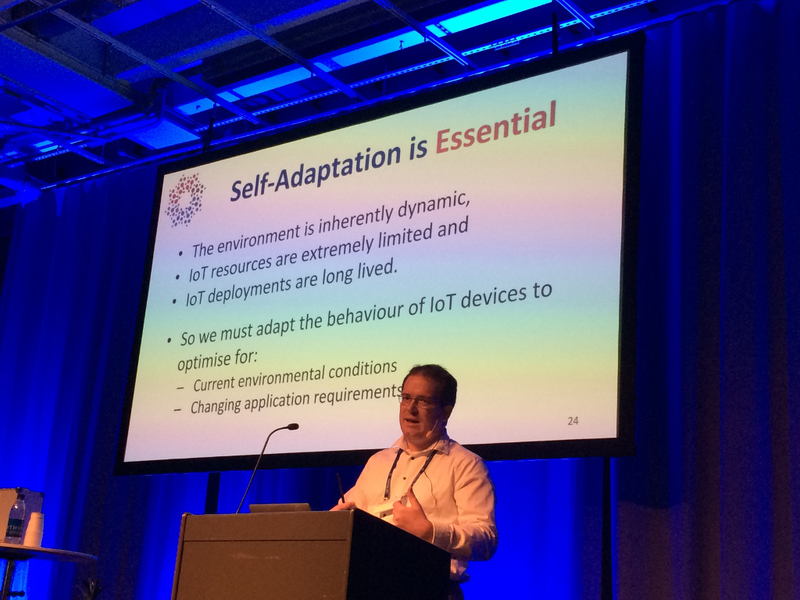 The slides of the keynote “Self adaptive software systems are essential for the Internet of Things” by Danny Hughes are available here. The SEAMS 2018 best paper award goes to “Requirements and Specifications for Adaptive Security: Concepts and Analysis” by Thein Tun, Mu Yang, Arosha Bandara, Yijun Yu, Armstrong Nhlabatsi, Niamul Khan, Khaled Khan, and Bashar Nuseibeh and the best artifact award to “SWIM: An Exemplar for Evaluation and Comparison of Self-Adaptation Approaches for Web Applications” by Gabriel A. Moreno, Bradley Schmerl, and David Garlan. Congratulations! The SEAMS 2018 proceedings are available as part of the ICSE 2018 proceedings on the official ICSE 2018 webpage. We have now officially published the SEAMS 2018 artifacts as issue 1 in the volume 4 of the “Dagstuhl Artifacts Series (DARTS)”. Register to SEAMS 2018 through the ICSE 2018 registration. Please note the early registration deadline of April 1st 2018. Keynote speaker confirmed: Danny Hughes will give a talk entitled “Self adaptive software systems are essential for the Internet of Things”. Extended submission deadline for all solicited types of papers (including the extended abstracts on “security and adaptivity”). The extended deadline is strict. 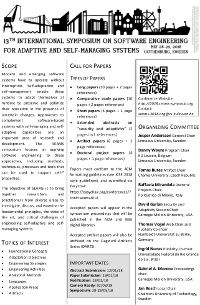 Visit the track page for the call for papers. SEAMS 2018 is co-located with the 40th International Conference on Software Engineering (ICSE 2018) in Gothenburg, Sweden and will be held from May 28-29, 2018. Follow SEAMS 2018 on Twitter and Facebook. Visit the track page for the SEAMS history.